A Manchester man was charged with domestic assault and public intoxication on Sept. 3 following an incident on North Short Moutain Road. Cannon County Sheriff's Deputy Eric Moss was dispatched there on that date in reference to a man assaulting a female on the side of the road. Upon arrival Deputy Moss found a female sitting in the ditch. He observed a man walking toward him and he instructed the man to sit down on the opposite side of the road. While Deputy Moss went to speak with the female, a witness told him that when she pulled up to the scene a male, identified as Joseph Burks, was on top of the female, Chasity Lusk, and was holding her down and beating her. 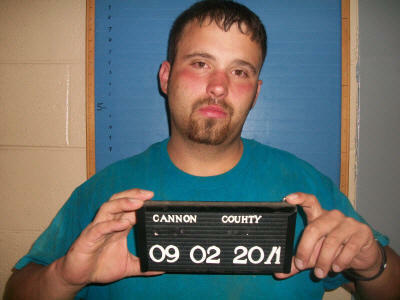 The witness stated she told Burks to get off of Lusk and he stated that she (Lusk) was drunk. The witness said she told Burks she did not care if Lusk was drunk, that he was not going to treat her that way. While listening to the statements of the witness, Deputy Moss helped Lusk out of the ditch and over to a nearby car. After making sure Lusk was not in need of emergency medical care, Burks was taken into custody and placed in the patrol car of Deputy Mike Smith, who had come to the scene to assist. Deputy Moss then obtained a statement from another witness, who said when he came down the road, Burks had Lusk down on the ground and was holding her down. The witness said Burks was holding Lusk around the neck, was pulling her hair, and when she tried to get up he would throw her back down on the ground. The witness said Lusk was calling for help when she could talk, but at times Burks had his hand in her mouth and at times she seemed unconscious. Burks, of 2122 Goose Pond Road, Manchester, was taken to the Cannon County Jail and warrants were obtained and served on him in the booking room. His bond was set at $4,750 and his initial court date is Nov. 1. Lusk was transported to the sheriff's department and released to the care of her mother. Horses belonging to Burks and Lusk were transported to a safe place by a citizen of the county to be picked up at a later date.